I'm not a steady worker. My creative energy ascends and descends along with the seasons and work load. After completing Engram 1 in February, I dedicated most of my studio time to printing fabrics with light and playful designs for Spring. Picking up the story, I'm reviewing, reviving, and making some small studies to see where the work leads me next. 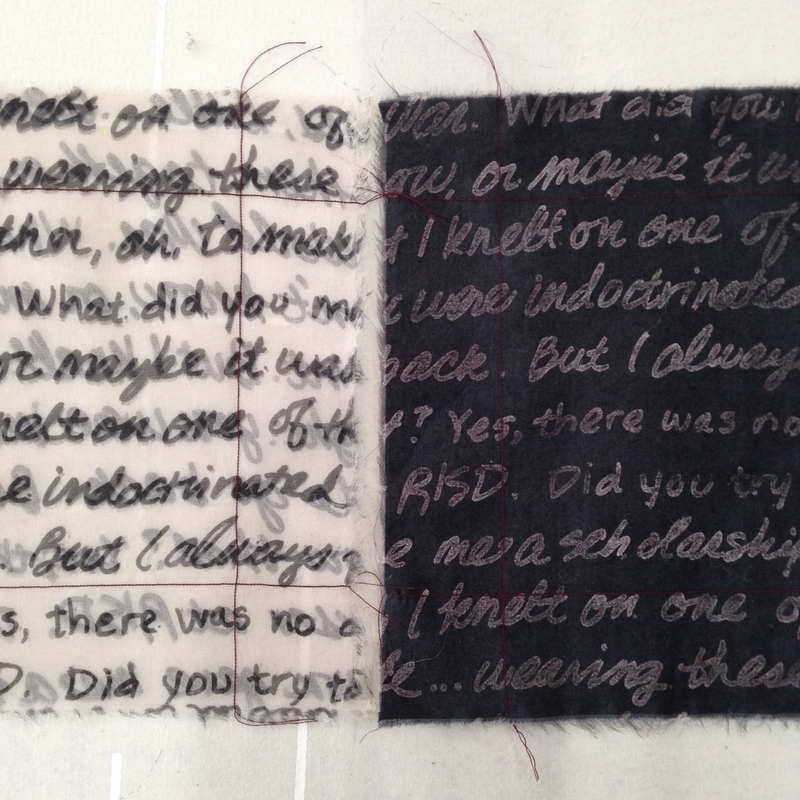 First, a series of the 8" squares explores lost and found text. 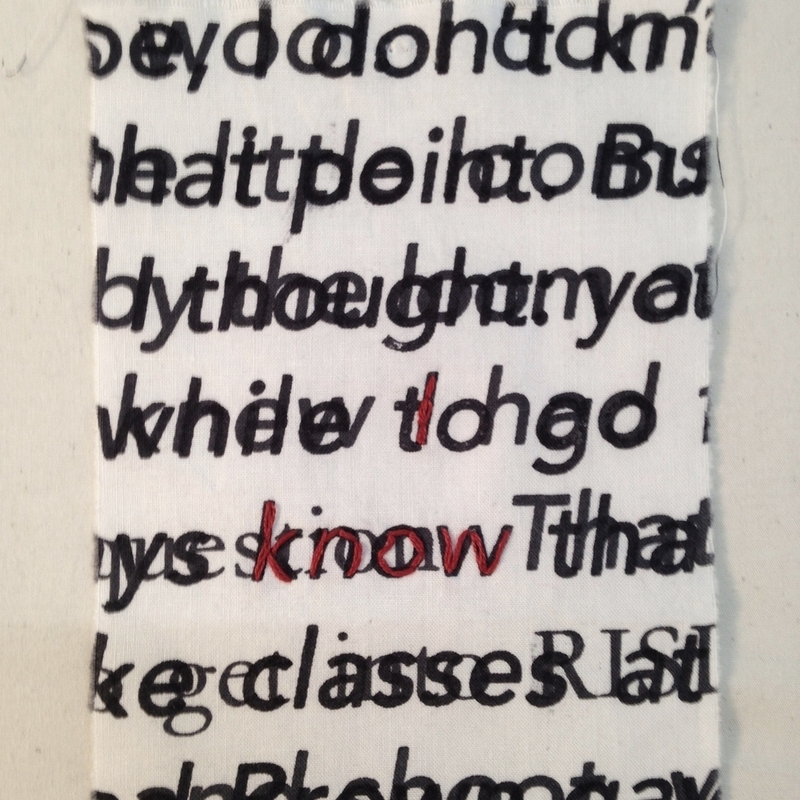 In the jumbled texture of printed words, I look for words not spoken, words that emerge and become visible when traced with hand and thread. Next, pages showing the grid margins in attempting to impose spacial order, in contrast to more organic hand-writing. In Orality and Literacy: The Technologizing of the Word, Walter Ong says*: "Print situates words in space more relentlessly than writing ever did. Writing moves words from the sound world to a world of visual space, but print locks works into position in this space." Using the handwritten translation of the story my mother told as the 'page', refers to that first translation from oral to text. *In Lupton, E. (2004). Thinking with Type (p. 106). New York: Princeton Architectural Press. Then, snippets of text, like T.S. Eliot's found poem, The Waste Land, waiting for assembly into a new story. And finally, another grid-based collage of smaller, 4" squares is more intimate than the 8' wall required for Engram 1.